Calypso, a strategic brand identity agency, recently strengthened its creative team by adding Arielle Tiner, a skilled graphic designer, and appointing Chandler Ives to user experience/user interface (UX/UI) designer. "Arielle's and Chandler's roles have been strategically tailored to meet the increased demand for visual communication." 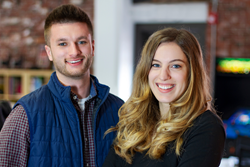 Calypso, a strategic brand identity agency, recently strengthened its creative team by adding Arielle Tiner, a skilled graphic designer, and appointing Chandler Ives to user experience/user interface (UX/UI) designer. The two design professionals support the development of digital and print assets for the agency's growing roster of clients including AES Corporation, Unitil Corporation, Wentworth Senior Living, Feeney Brothers Utility Services, and Portsmouth Neuropsychology, among others. Tiner joins Calypso from H.H.Brown Shoe Company, Inc, owned by Berkshire Hathaway, where she worked as a graphic designer. In her role, she designed marketing collateral, including print and digital assets and trade show imagery, and created emails for multiple shoe brands. At Calypso, Tiner will develop thoughtful and engaging digital and print creative to adhere to the brand standards of a plethora of clients. As part of her role, Tiner will create web and social media graphics, print and online advertisements, e-books, brochures, promotional items, and signage, and will perform photo editing. "Calypso's strong reputation as an established and respected marketing and design agency, combined with its vibrant website and touching client testimonials, inspired me to explore a future with the organization," said Tiner. "I'm thrilled to be able to work with Calypso's robust list of partners and am looking forward to applying my graphic design experience across a variety of industries." Tiner grew up in Hampstead, NH and is now a resident of Portsmouth. She received her bachelor's degree from Plymouth State University in graphic design. Tiner spends her free time exploring the local culinary scene for her Instagram account, @portsmouthfoodie. Ives joined Calypso's growing creative team in 2017 as a graphic designer. In his new role as UX/UI designer, Ives will utilize his expertise in digital design and user experience to help clients create effective brand and marketing materials that engage customers and also adhere to the latest website and usability standards. "Chandler is a digital design expert who can develop a beautiful interface, as shown throughout the Calypso website. Most importantly, however, he recognizes the importance of a seamless user experience," said Houssam Aboukhater, Calypso's managing partner. "Arielle's and Chandler's roles have been strategically tailored to meet the increased demand for visual communication."